On February 4th, we created a Change.org petition requesting the City Council to landmark the First Christian Church, which is for sale and is endangered. Since then, a lot of people have asked why it’s important to do this or they think that because it’s on the National Register, the church is protected. I thought I’d devote this blog to explain what it means to landmark a building. 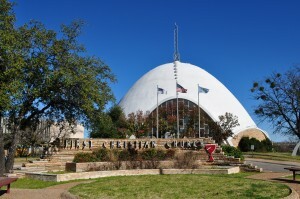 The First Christian Church was added to the National Register in 2011 for its architectural and cultural significance. If a building is on the National Register, it does qualify for tax credits to repurpose or restore it; however, it in no way protects it from being demolished. 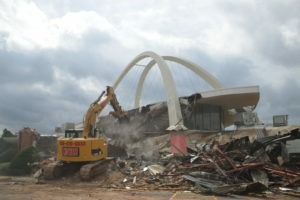 An owner can file a demo permit with the city, get it approved, and take it down just like that. 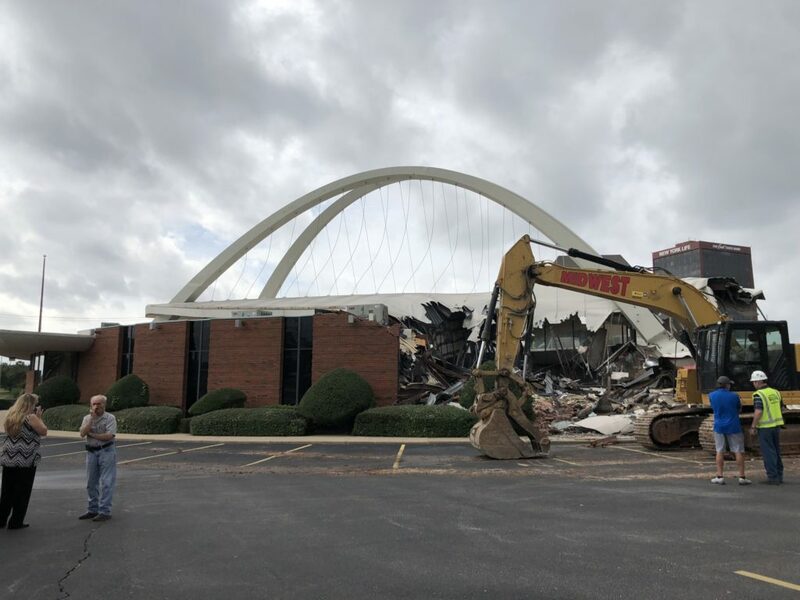 … when the demo permit was issued at 8:00 a.m., and Midwest Wrecking got to work taking down this fine example of mid-century modern architecture 30 minutes later, we knew we had to get on the ball with other endangered treasures around town. Not long after Founders Bank came down, we started hearing from some very reliable sources that a potential buyer was calling the city to inquire about restrictions on demolishing buildings on the First Christian campus. Now, to be fair, I don’t know what their intentions are, to demolish the buildings at the bottom of the hill (the Youth Center and Disciples Building) and/or the ones at the top of the hill that include the dome. But, I didn’t want to wait to find out. Around the same time this happened, we learned that the City Council has the power to declare a building a landmark. And why would they want to do that, you ask? … and arguments can be made for such things as alternate uses, keeping our city unique, and preserving our history. 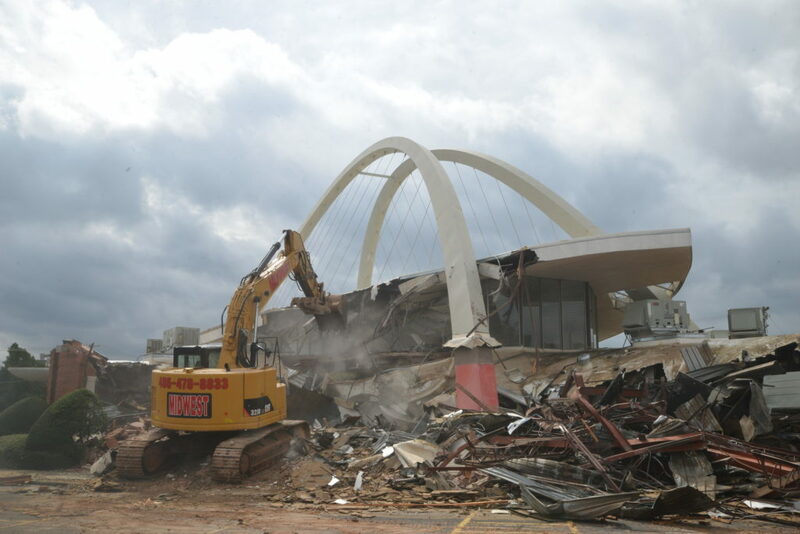 Basically, it adds a layer of review and conversation … and hopefully a lot of thought … before a demo permit is granted and a building can be demolished. So, how can a building be declared a landmark? Well, in theory, it’s pretty simple. 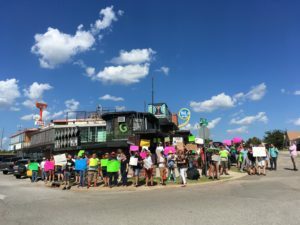 You, me, or any OKC citizen can go to a City Council meeting and request to speak in the Citizens to be Heard segment at the end of the meeting. I did this at the last meeting on Tuesday, January 29th — go to the 2:30 mark to see the discussion. The City Council has little experience going through the process of declaring a building a landmark, as you can see in the video of the last meeting. The Council doesn’t seem to realize that they have the power to make one building a landmark without having to go through all of the steps to declare an entire neighborhood as an HP district. Luckily, some of my friends in the planning department are going to present members of the City Council with information on how they can very simply get a building listed as a landmark. If the owner is not cooperative in obtaining the landmark designation, the City Council must have at least seven votes in favor and — ta-da! — a building is a landmark. It’s magic! Once the conversation between the planning department peeps and council members occurs, I’m planning to go back in front of the City Council to once again request that they make the First Christian Church a landmark. In addition, I will present them with the petition numbers we have gathered that will let them know just how important the church is to our community and beyond. So, if you haven’t signed the petition, please take a minute to do so and share it with your friends. Go here to sign. We will keep you posted on what happens! UPDATE 2/22/19: Our speculation has been verified. A church board member contacted councilman Ed Shadid informing him that the potential buyer definitely plans to demolish all of the buildings on the 32-acre campus and develop the land. He was hoping Ed could calm the buyer’s fears about the possibility of landmarking the church and also ensure the buyer that their development plan could go forward smoothly. Ed was unable to meet with the potential buyer and now plans to make a motion at the March 12th City Council meeting to start the process of designating First Christian Church a historic landmark. Thank you, Councilman Shadid! UPDAT 3/6/19: Go here to read about our very fun and successful Save the Egg rally.